An exclusive range commissioned by The Hayward Gallery, SouthBank Centre, as part of their reopening launch after a two-year refurbishment. A sympathetic and tactile representation of the brutalist Hayward architectural features on a range of homeware and stationery products. All products have been printed and finished in the UK. 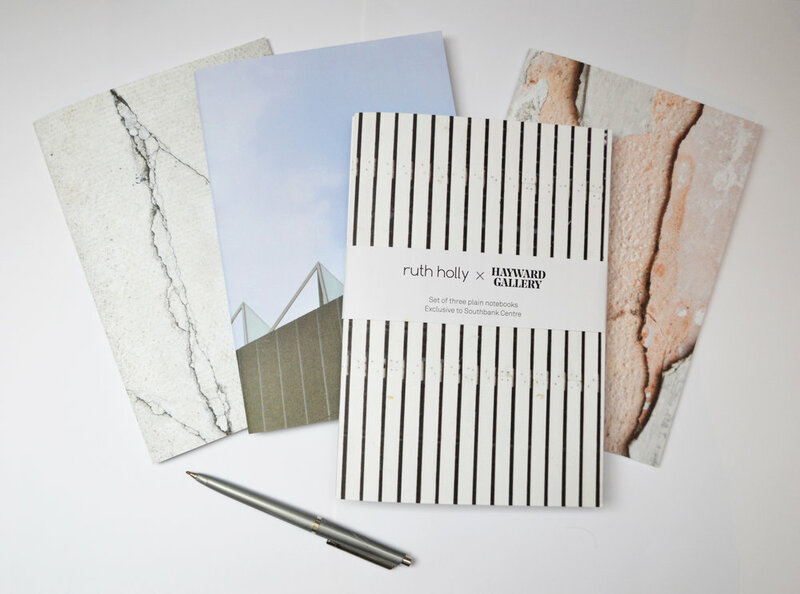 A5 notebooks featuring details and patterns of The Hayward Gallery. Limited edition print, featuring the outside texture of The Hayward Gallery. Placemats in three designs: Wood texture, Graphic Stripe and Concrete texture. Limited edition print, featuring the triangular windows of The Hayward Gallery. A white cushion featuring textural pattern found at The Hayward Gallery.